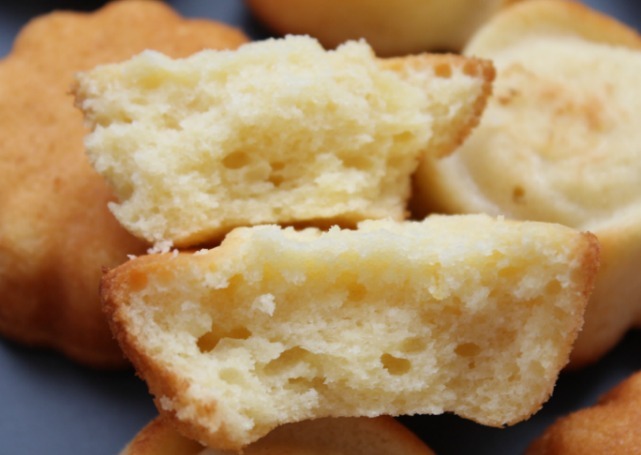 my bare cupboard: Cold oven cream cheese mini pound cakes "
Have you ever wonder why if baking a cake in a cold oven , that is , without preheating it first really works ? 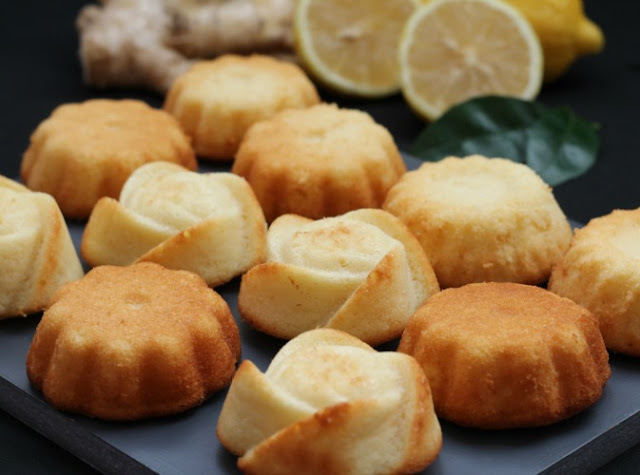 The lemon zest and fresh ginger adds a nice contrast to the richness of the cake , good thing that I've thrown out my ground ginger because using freshly grated ginger is way better er if you love ginger , that is ! * Butter muffin tins . * Combine flour , baking powder and salt in a small bowl . Beat cream cheese , butter and sugar in a large bowl until light and fluffy , about 3 minutes ; add eggs one at a time , mixing after each addition and scraping down sides as necessary . Beat in vanilla , ginger and lemon zest . * With mixer on low , gradually add flour , when all the flour has been added , mix for 30 seconds on medium . * Pour batter in the prepared tins , about 3/4 full . * Bake for 325°F / 150°C for 28 minutes or until a toothpick or a wooden skewer inserted comes out clean . Do check out some blogging friends baked goodies ! Your mini version looks cute! 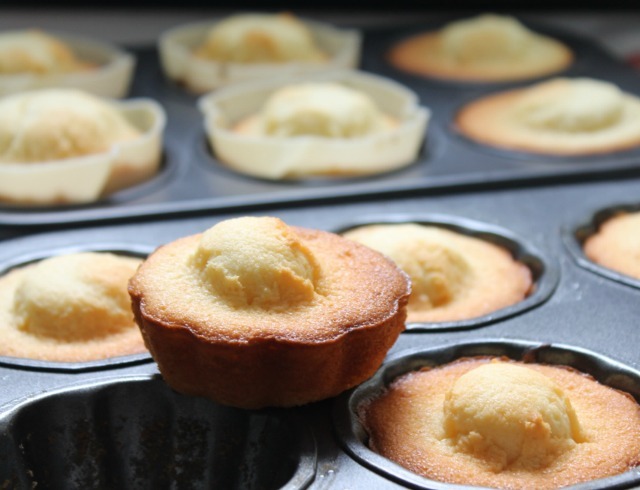 Mini version is very popular with some of our Bake-Along friends! They look fantastic! Glad that you've enjoyed the cake! Thank you for stopping by my garden and for following too! I have neglected my garden this past year, but have plans to re-organize after CNY! Hi Anne! I realised you are baking/making mini or indivual served version of the original recipe lately. I like that. Have you resolved all the photo problems with google? Nah , I think as Ann of Anncoo Journal commented , I've used all my free 1 gb storage in Blogger but a little notice prior to deletion of all photos would be nice , right ? They are adorable with such soft and moist texture. I will enjoy lemon and ginger flavor. these are beautiful! really liking your photography on these. oh, you got a flower mould too? that's very pretty. As for the mini ones..hehehe..mini volcano..i wonder why...yes the cake is great in texture and i can see yours lookng fluffy too! thanks for baking with us! btw, me, joyce and zoe were just talking abt backing up our blog after reading your painful experience! Hi Anne, love the golden little cakes. Anne, I was just checking out the new entitlements for Google, new accounts have 5GB of storage inclusive of photos. How about writing in to Blogger and ask to be moved to the new plan? I like how you bake them into mini size, handy to eat! These sound delicious and those little rose shaped cakes are so beautiful! Whew! Glad your photo problems have been solved! What a pain. I've made a large pound cake which started in a cold oven...it's one of my favorites! So I know your mini-cakes must be just as wonderful. Love the cute shapes!!! Hi Anne, wow.... so cute and lovely mini size cake. You got save 4 pieces for me? Like the texture, look so soft. That little bump can be mistaken as a madeline don't it? These are so cute & lovely! Glad that you've solved the problem with your photos. Till now I've not finish uploading some of the photos of my blog ! :( BTW how do you re-backing your blog? I'm a real PC dummy!